Choosing between soft shell and hard shell luggage is really not as simple as it sounds. There are plenty of options out there and choosing the ideal one can be tricky. The one thing that makes it harder is that the prices of two vary significantly. This is the reason it is important to recognize your needs and then make a purchase. Here are some of the factors you should know that will help you choose wisely. When it comes to luggage bags, the first and the foremost thing that the travelers want in their travel kit is durability. You don’t want to be in the middle of the road with a broken bag! This can easily turn into any traveler’s nightmare. Having said that, hard shell cases are best if you travel with iPad, laptop, camera or any thing that is fragile and needs protection. This is when you should consider buying hard shell cases. These cases, though not always, are also water resistant that can protect your stuff during rain, puddle, snow and splashes. It is also a great protection against stains. Due to its hard shell, it is also easier to maintain the bag and clean it, especially if you are moving from city to city. This type of travel bag is best if you will be travelling for a longtime and to rugged locations. Soft side cases are made of fabric and do not offer the durability of a hard case. However, if you are travelling in a rough terrain, you can most certainly prevent the gashes and bruises that your hard case travel bag will be subjected to. Hard shell luggage pieces are more prone to wear and tear during travel, as compared to softer cases. However, the manufacturers have taken heed of the potential damage and they are now designing bags that can flex a bit without breaking or falling apart. They are able to withstand the impact of a fall and still remain scratch free. These new bags can sometimes be even lighter than the soft-sided luggage bags. Soft-sided bags, however, take the cake here as they are lightweight and less likely to break in the middle of the journey. This option may particularly interest the travelers who travel rough and who do not want to compromise their bag in the middle of their journey. When you are travelling with a hard-side bag, then you can rest assured that any new items you buy will have to go in another bag, especially if you are already travelling heavy. If you are planning to shop along the way, then it is better to carry a soft-sided luggage because it gives you the flexibility to add more stuff, which the hard-sided case will not. Soft luggage can stretch along the edges and it is also easier to fit them in tight spaces. Hard sided bags, on the other hand, do not offer flexibility and demand its own space. Hard cases come in variety of designs and patterns that may not be possible in a soft-sided luggage bag. Having different patterns on your bag will help you spot yours at the baggage carousel easily. At the same time, carrying a funky bag on your holiday can also be fun. Soft-sided bags, on the other hand, only come in different colors and not patterns. They are also prone to getting dirty after a few travel trips. Soft-sided luggage clearly takes the cake here for being incredibly accessible with their front pockets. They offer convenience to the travelers by providing easy access to things they need along the way. Hard sided cases, on the other hand, do not offer that accessibility. If your preference is convenience and ease of accessing things, especially if you travel a lot with children, then you should pick a soft-sided luggage so that important items are handy. When you want to buy a luggage bag, you need to weigh your options against all the variables and then make an informed choice. Both hard-sided and soft-sided luggage bags have their own pros and cons, knowing your preferences will help you narrow down the options. I personally own both types, and I use either one depending on what I need, so lets take a look at some of the pros and cons of hardside and softside cases and see if you can decide which one is right for you! When i’m travelling on a longer trip with my hand luggage suitcase, I almost always take my soft side case. I personally find it easier to pack, with one deep capacity to arrange all of my things. The problem for me with a hardside is you have to have two separated halves, which I don’t like as much as the single space. With just the one opening lid, its way easier to put on a luggage stand in my hotel, which in some hotels rooms is really essential, because so often you’re really limited for space. When i’ve been traveling with my hardside case I often find myself having to open the two sides to get anything out, and I would much prefer not to keep my belongings on the floor. Also with the flexibility of a softside case, you often have to option to unzip the expander, which for me is perfect. I’m quite a heavy packer, and love holiday shopping and buying souvenirs. So when I get to check in, and they’re eyeing up my case for size, I simply sit on it, give it a good old squish, and cram it right in there. There is also the important benefit of softside cases usually having a lot of pockets and compartments, which is perfect. The one I’m using now by IT luggage has a large zippered pocket on the front, plus a smaller one above, and a large flat pocket at the back. This makes it so much easier to pull out documents, money, anything you might need to be able to access easily when you’re travelling. Although the cases still maintain their soft exterior look, often they are reinforced by a hard inner lining to reinforce and keep the shell strong. Also with the softside, its way harder to notice wear and tear. Scrapes and bumps don’t really show on softside cases. With the hardside cases you can really tend to see scratches and bumps. I suppose if you’re extra careful you might be ok…but who has time for that when travelling?! I’ve also had a slight problem with hard side luggage easily sliding around when I’m taking the bus. 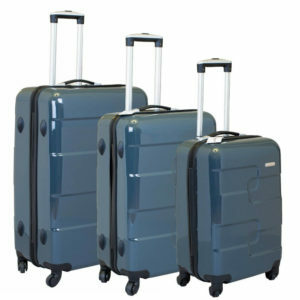 Also softside luggages are just easier to stack, and store in small spaces. When it comes to travelling in style, hardside cases are undeniably way sleeker, and super trendy right now. I love the amazing range of colours and patterns you can choose from, so you can be bang on trend when you’re at the airport, and know that you’re travelling in style. If i’m going on a shorter trip, and don’t need to pack loads and loads of things, I do like to take my hardside case, I can pack a few outfits and clothes on one side, and accessories and shoes and other bits on the other side, which can usually be zipped. So the little miss tidy in me feels pretty satisfied. I think the main attraction with a hardshell suitcase is that is feels stronger and more secure. You know that its going to stay intact in the hold, under the weight of loads of other cases, and your belongings will be safe. I feel that sometimes my softside case can get a bit crushed or misshaped. It is also better for use in all of the elements. The hardshell is of course waterproof. I had a bad experience once with all of my clothes getting soaked through with what smelt like rum or some kind of alcohol, whats worse is it wasn’t even mine, and I don’t like seeing things go to waste! For me the main attraction of the hardside case is how lightweight it is! Its way lighter than most softside cases i’ve had experience with. Also the four spinning wheels. Perfect for when you’re in a rush running through the airport, the four wheels glide so smoothly. Of course both of these types of cases have clear benefits. From personal experience now I’m talking about carry-on size, and I personally prefer my softside suitcase just for the practicality. I’m always rushing and fumbling around the airport so look to have my things easily accessible, and often need to cram things in last minute. I would always take my softside for work trips, and usually my hardside for short leisure trips. At times when I’m looking to be a little more fashionable than practical, I tend to opt for my hard side, its a gorgeous shiny metallic baby pink colour, and I cannot resist something pink and shiny. Its perfect for a weekend away, but I would have to pack lightly if I was looking to buy anything on my trips. So, really, you need to look at what you’re looking to get from this case. It depends so widely on each person and what you need it for. Both styles serve excellent purpose and I know will get you and your luggage safely to your destination, so now you just have to decide which travel companion is right for you. Good luck!